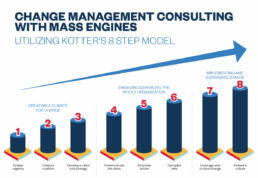 with Change Management Consulting from MASS Engines. MASS uses an established change management framework to create a culture of innovation and MarTech competency in your business. A vision and plan that motivates buy-in. Establish a sense of urgency within your team. By introducing team members to a shared vision and engaging with their particular pain points, we get them ready to adopt your new systems. Our training then shows the stakeholders exactly how and why the new paradigm will help them. Motivate alignment and adoption with a change management process that makes the most of your people, processes, and tools. Our process emphasizes collaboration and measurable goals, keeping conversations focused and actionable so your project can move forward. Models that enable long-term optimization. Technology changes, turnover happens, and strategies shift. Through all of it, we will partner with you to help with every change management challenge. We continue to push your teams to the next level of engagement, consistently driving better results to optimize your MarTech investment every step of the way. How do people adopt change and adapt to technology? This question has puzzled companies for decades. At its root, this is actually a question about people and information – understanding how people learn and, more importantly, what makes lessons stick. MASS Engines helps you motivate meaningful change in your organization. We put people and information at the center of our process, helping you to identify challenges, communicate solutions and ensure long-term adoption across your organization. Together, we will empower your teams to maximize the potential of your MarTech stack. Change management is a vital part of our results-focused framework for MarTech success. Using this approach, here is what we have achieved for other B2B companies.